Follow me on Twitter @robcain or Sina Weibo @robcain, or connect with me onLinkedIn. I was invited recently by a French cinema publication to write an article about the SARFT-imposed summer blackout of foreign films, or “domestic film protection” period, in SARFT’s parlance. As I put the finishing touches on that piece, I thought I’d share a few pertinent thoughts here, along with a bit of data. 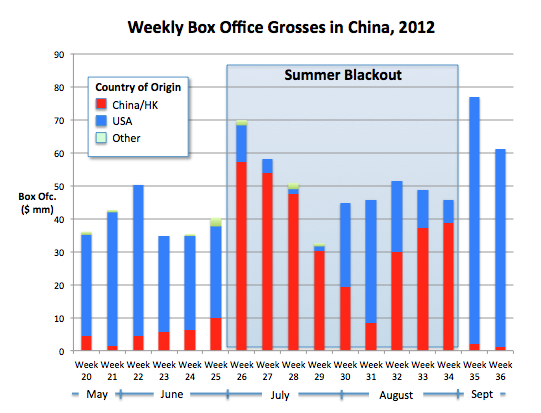 This is a week-by-week chart of box office grosses in China in the weeks before, during and after the summer blackout. The red areas represent revenues from Chinese films and China co-productions (mostly with Hong Kong), the blue areas represent grosses from American films, and the green represents other foreign films. The gray shaded area represents the period when the blackout was in effect. The blackout was a partial one, in that it excluded all major live-action Hollywood films, but it did allow for the releases of a couple of Hollywood animated films, Ice Age: Continental Drift and The Lorax, and three non-studio action pics, The Mechanic, Abduction and Lockout. The main goal of the Chinese authorities was to open up more screen time for Chinese films and to give them a shot at making some money without being overwhelmed by Hollywood’s summer tent-poles. As I’ve stated before, I don’t believe that the goal was to diminish the grosses of American movies, although that was undoubtedly a consequence of the blackout. 1. The blackout was successful for a handful of Chinese films, but it went on far too long. That big red spike in week 26 represents the opening of Painted Skin: Resurrection, a Hong Kong-China co-production that became China’s highest-grossing film ever, with a $115 million final tally. There’s no question that the movie benefited greatly from the blackout. But Chinese filmgoers weren’t much interested in other Chinese films, and attendance flagged throughout all of July until Ice Age came along to rescue the exhibitors. 2. Attendance suffered. Prior to the blackout, China’s year-to-date movie exhibition revenue was up by 41 percent over the same period in 2011. During the blackout revenue dropped by nearly 10 percent relative to 2011. By my reckoning the blackout cost China’s exhibitors about 30 million ticket sales and over $200 million in revenue. 3. The blackout created pent-up demand for Hollywood films. Just look at those big blue spikes in weeks 35 and 36. The Amazing Spider-Man and The Dark Knight Rises. Enough said. Even though the blackout was costly for China’s distributors, exhibitors and mall operators, I expect we’ll see more such “protection” periods in the future. 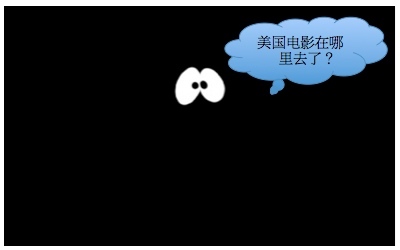 If SARFT learns its lessons from the experience of the summer, it will make future blackouts shorter and less punitive to Hollywood imports. This entry was posted in Analysis, Box Office Reports, Opinion and tagged blackout, China box office, domestic film protection, Rob Cain, Robert Cain, SARFT by chinafilmbiz. Bookmark the permalink. Robert does your blog have a lot of interest from the US? Is there an appetite for knowledge about China in the American film industry? I labour under the common perception that the US is inward, rather than outward looking. Maybe I’ll be proved wrong! Yes, Chinafilmbiz has a large and growing following in the U.S. Although the blog is widely read in over 100 countries, U.S. views account for over 50 percent of all the traffic. The UK is 2nd with almost 6 percent, and Singapore is 3rd (surprisingly, given its small population) with 5 percent. Rob, I live in South Africa and I love reading your valued info. BTW, I’ve received an LOI from a Chinese network called LIC to get my reality TV series shown in China……..do you know of them? Hello Louie, thanks for your much appreciated feedback. LIC is significant player in the production and distribution of TV programming in China. Over the years they have had co-production partnerships with Discovery, Animal Planet, and other foreign networks. Thanks for your feedback…..much appreciated! I got the LOI from LIC so that I can get past the import quota as a foreign TV and film production company. A question; how many viewers do they have? Louie, I don’t generally follow the TV industry in China– this is primarily a movie oriented site. I’m sure if you ask LIC they’ll be able to tell you. Thanks Rob, I’ve been given a figure of 1,27 billion viewers and told by other sources that the TV industry in China doesn’t have that many viewers. In any event, I’ve tried to link with top production companies there for feature film co-production shooting in China with Chinese actors and I don’t even get a reply. Again, your info and articles are very informative and of great interest. This is a very intersting piece (as your stuf always is). Is this an effective way of protecting Chinese movie productions. It seems very ham fisted to me. Bill, I agree, blackouts are not the ideal approach as they cost Chinese distributors and exhibitors money, and they deprive moviegoers of the films they want to see. But no one seems to have any better ideas as to how to protect Chinese movies from being completely overwhelmed by imports. Surely, with all the new money around in China the number of home grown movies will rise and out number the US imports which are restricted in numbers anyway. The Indians manage it, Bollywood produce far more films than the Americans ever could. Volume of production is not the issue; China will make over 600 films this year. The issue is quality and audience appeal of these films.